Quartet of singles from the 1960s. The first three are from the Voice of America collection and are in Swahili. They include a cut by the great Daudi Kabaka, an artist more usually associated with Equator. 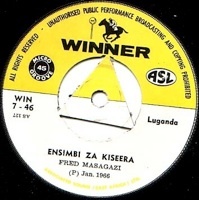 The fourth is a 1966 single by Fred Masagazi, one of Uganda’s most famous singers, who also recorded extensively in Nairobi. Win 7-41 turned up on Ebay in February 2012. Unusually, the label carried a very precise release date: 1 August 1965.